I love citrus flavor in baked goods.Especially Orange,the mild tinge of orangey goodness in a cake is too hard to resist.It is a dominant flavor in this cake and strangely,I haven’t much used it in my cakes after that.While going through some recipes,I remembered this cupcake recipe which I learnt in a baking class I attended a while back.The class dealt with baking with fruits and I joined because I was curious to know what it was all about. The class itself was a short one with 9 recipes covered in two days.But to be honest,I was disappointed[not with the recipes though! ].I expected an interactive cooking class where we were also a part of the whole process,but this one was more like a sit-and-watch kind of a thing.Nevertheless,it was a learning experience was for me.The little tips and tricks shared by her were quite useful. This is the second recipe from the class.The first one being this cake,the original recipe used Lychees in syrup but I substituted it with Strawberries. I used a variety of Orange called Kinnow.It is not very bitter tasting hence works perfect for this cake. The recipe is copyrighted and hence cannot be reproduced here.Sorry!! Few more days left to send in an entry for my event The Best Chocolate Cake.Have you baked your chocolate cake yet?? oh wow that look super moist and super delicious. Wonderful!! You went for her class? Been wanting to go for herbread baking classes but the distance had me back out. Oange and chocolate..love the combination too! i love orange-chocolate truffles, so im totally in for these!! 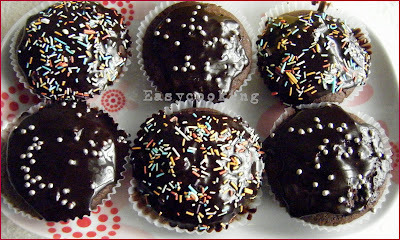 You made me crave for some chocolate cakes now, slurp !!! !Orange and chocolate, interesting combination.Clicks are awesome. Hey, this is a new way of using orange in a cake. 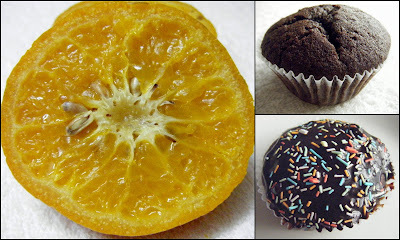 Yumm.. even I love orange in cakes... in fact am baking one today! Love love orange flavour in bakings and thislooks so so cute. interesting recipe...should we boil the orange along with the peel and blend it too? Such a beautiful and cute cupcakes, lovely toppings.. The cupcakes looks so yummy n moist . Lovely pix too !! 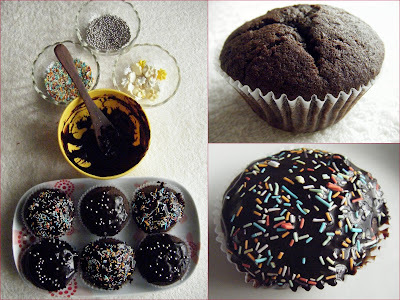 yummy cupcakes.. looks absolutely delicious.. nice clicks too!! Love them! I love orange + chocolate combo! the cake looks spongy and tempting. I like the citrus touch in baking and chocolate pair quiet well! baked it..loveeeed it and blogged it!! still looking for a good chocolate cake..
thiese cupcakes look yum..sadly am on a self imposed sweet ban ..but cant help drooling at the lovely pic! Cake looks moist and delicious! MD..the unique flavor of these cupcakes come from the whole Orange pulp,I don't think Orange juice can recreate the taste.It is my opinion though,maybe you can try it and we'll have a different flavored cupcakes altogether!! what gorgeous cup cakes , divya! hey girl, do suggest an easy birthday cake for me to bake on my lil one's first birthday! Love the citrusy flavor. i should make these with the Californian oranges we get here! So luscious frosting Divya. Oh My Gosh!! Lovely Cupcakes and gr8 ideas :) Keep up the gud work.